Where it all started! 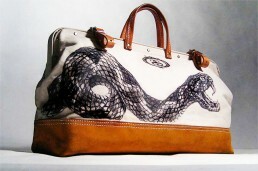 The Original Snake bag. 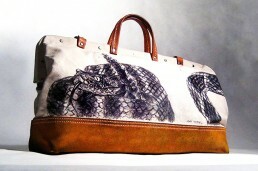 On the front, a python ready to attack with Seth Stevens initials proudly monogrammed front and center. On the back, another snake, coiled and hiding from the world. The front exhibits a tougher, more aggressive side for the world to see. The back portrays a more shy, introverted and cautious depiction, when there is no one looking, Bag 001.